Is It Real or Is It Fotoshop by Adobé? You are here: Home / Advertising & Marketing / Is It Real or Is It Fotoshop by Adobé? 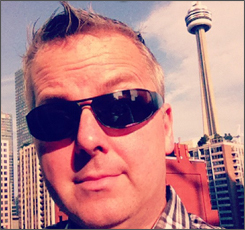 Throughout the early 1990s I worked as a graphic designer at a Toronto studio. We had several accounts, but the two that kept me busiest were a popular makeup brand and a packaged meat company. You can draw your own obvious parallels between the two. The main tasks involved making the models and meat look beautiful and delicious enough for you to open your wallet. 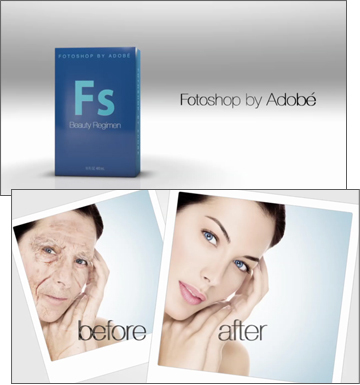 The primary weapon in our arsenal was Adobe Photoshop, and we would use it to (as the video shows) make fuller lips, change eye color, make whiter teeth, remove blemishes or unsightly veins, change skin color or in extreme cased literally create a frankenimage form various photos in the session. If her elbow looked funny, we’d grab an arm from another photo and blend it in. Northern California filmmaker Jesse Rosten was inspired to create the video after watching a beauty product infomercial. To his eye the before and after portraits of the model looked like they had been photoshopped. It’s been nearly six years since Dove posted the infamous ‘Evolution‘ video, so the use of Photoshop in advertising shouldn’t surprise anyone. Read more about my adventures with Photoshop retouching in Beauty is Pixel Deep on YummyMummyClub.